How are you guys doing? The weather is really hot nowadays, isn’t it? Am just waiting for this May month to get over soon! Do you too feel the same? Following the review of Natural Bath & Body Grapefruit and Vitamin C Fabulously Fruity and Sparkling Foaming Cleanser, today am here with another face wash from the same brand. 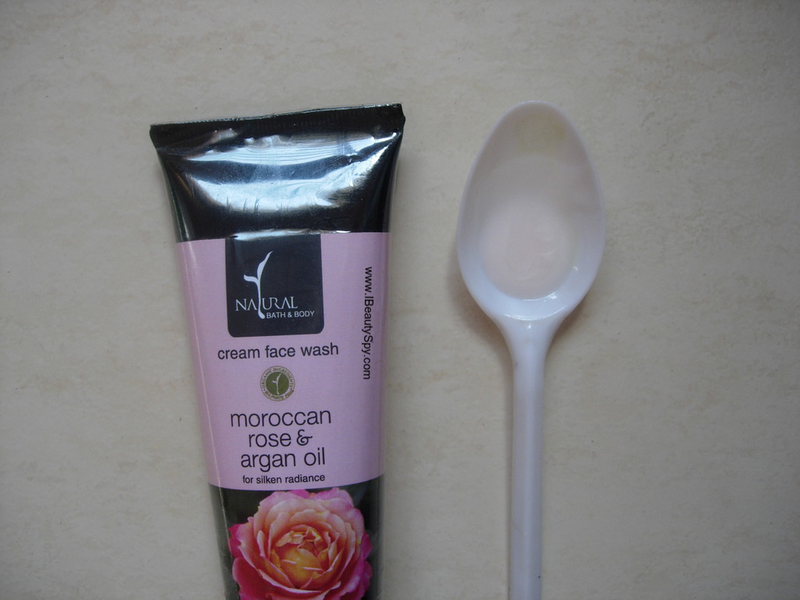 Its the Natural Bath & Body Moroccan Rose & Argan Oil Cream Face Wash. I got this too in the 40% discount sale on Smytten. 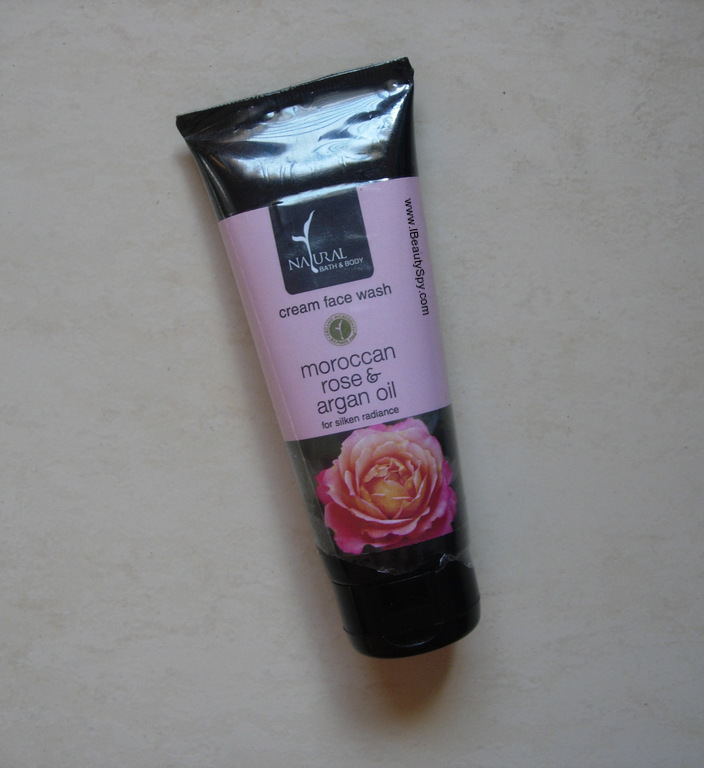 We all know that both rose and argan oil are good for skin. Argan oil is called as ‘liquid gold’. I have rarely seen the combination of rose and argan oil in a face wash. So I decided to pick it up as it was affordable as well after the discount price. All Natural Bath & Body products are free from parabens, sulfates, harmful colorants, preservatives, fragrances, and other abrasive cosmetic chemicals. Want to know whether you should try this product? Does this give silken radiance as claimed? Then keep reading. A smooth fluffy cream lightly whipped to give a beautiful lather that cleanses the surface of the skin gently and restores a youthful glow. Infused with an intoxicating moroccan rose fragrance and calamine powder feels like sashing your face with a cloud. Natural Bath & Body Moroccan Rose & Argan Oil Cream Face Wash looks white in color but has a very slight baby pink tint if you look at it closely. It has a smooth, creamy consistency and is a bit on the runny side. It has a very slight fragrance of roses but not very noticeable. What I like about Natural Bath & Body products is that they haven’t added any artificial fragrances in their products. This is a cream based face wash and would suit for normal-dry skin types. It doesn’t lather much. I just take a coin sized amount and massage my face with it and then wash off with water. I doubted whether it would cleanse my skin properly as it didn’t lather much. But to my surprise, after washing, my skin felt well cleansed. It doesn’t leave any layer or residue on skin unlike usual cream based face washes. It also doesn’t dry out skin and keeps it soft. I don’t see any glow on my face as claimed. Nor any silken radiance. Its cleansing properties are medium – neither deep cleanse nor superficial cleanse. I like to use it in mornings when there is not much dirt on my skin or when am staying at home most of the day. However, if you prefer a deep cleansing face wash, I would suggest you to go for the Grapefruit & Vitamin C Foaming Cleanser. The ingredients list again is not that great. It is free from parabens, sulphates, colors and fragrances. But the natural ingredients calamine, argan oil and rose oil are listed towards the end only. So am not sure how much they will benefit the skin. To conclude, I am not much impressed and so won’t be repurchasing this face wash. There are many other sulphate-free face washes in the market which has more natural ingredients and in higher proportions. No. It doesn’t give any youthful glow or silken radiance as claimed. But it cleanses skin gently as claimed. * Gentle, cream-based face wash.
* Free from parabens, sulfates, artificial colorants, fragrances. * Suitable for normal-dry skin types. * No youthful glow as claimed. * No silken radiance as claimed. * Natural ingredients are listed towards the end of the list and might be present in small amounts only. Yes, if you wish to try a new, gentle, SLS-free, cream based face wash for normal-dry skin. But there is nothing impressive otherwise to recommend. 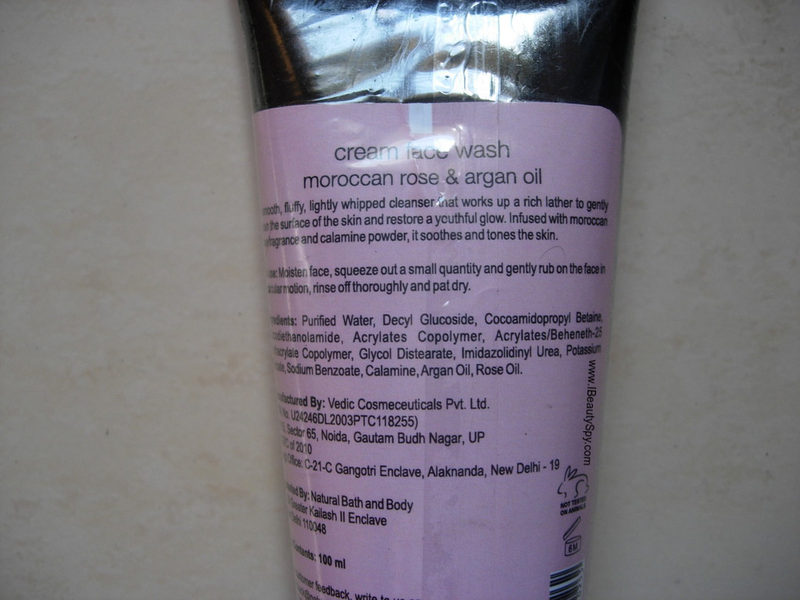 Overall, Natural Bath & Body Moroccan Rose & Argan Oil Cream Face Wash is not a bad or disappointing product. I don’t regret buying it. But its just that nowadays there are a lot other better face washes available in the market with so many natural ingredients. There are no bad stuff like SLS, parabens in this face wash. But there are not much good stuff either. And it doesn’t deep cleanse either or give a glow. So I would say skip this. Not much impressive. I would skip this but I was always intrigued by the name of this. Thank you for the honest review. I’ve wanted to try this one from a long time but I think I’ll skip it now.